You’re invited to the most scenic and relaxing resort experience in Palm Springs. 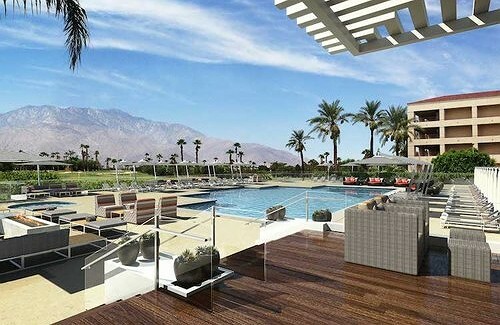 Fresh off a multi-million dollar renovation, the DoubleTree Golf Resort Palm Spring, formerly The Desert Princess Golf Resort, features an elevated style, contemporary vibe, and an unbeatable setting at the foot of the San Jacinto Mountains. Immerse yourself in stunning golf course and mountain views, while escaping the chaos of everyday life. Let your mind and body slow down and enjoy some much needed repose, as you enjoy a seemingly endless array of first-class amenities. From an Olympic-size swimming pool, tennis courts, a full-service spa, two luxurious hot tubs, and a 27-hole championship golf course, the DoubleTree Golf Resort Palm Springs is the definition of ‘vacation.’ Contemporary, casually elegant, and inviting, the DoubleTree Golf Resort Palm Springs offers deluxe resort accommodations and unbeatable service.